Tonight's featured phrase is "Thank You"
In honor of Rochelle's 78th birthday, she has requested that "Thank You" be the featured phrase of the week. "Thank you" is simple, to the point and you can use this particular phrase in response to....well...whatever may be coming your way. "Thank you" works with pleasure and, it even works with pain, because no matter what may befall you, you can always mine it for some kind of "goodie" to be thankful for. As it has occurred to me, "No matter what, gratitude is always an appropriate response." Now, I understand how difficult this may be in the middle of excruciating pain or torture, which requires an advanced course in gratitude. But for most of us the garden variety of travails and tribulations we encounter daily often as not fall into the categories of irritations, annoyances, frustrations or bummers. Gratitude works quite well with any of those predicaments. At the very least it will create a pattern interrupt which, if you can bear it, will open the possibility that you do not have to be bummed out by these disturbing affronts to your well being. Gratitude, particularly the "Thank You" kind can actually open the door to finding the meaning or advantage contained in any displeasure. And if you can do this more and more often, you just might find that you are not the victim of these unpleasant offenses, but can transform any of them into your growth and benefit. So, I hope you are inclined to say, "Thank you," for this insight, but if you're not quite there yet, "Let me think about it," is a good place to start. 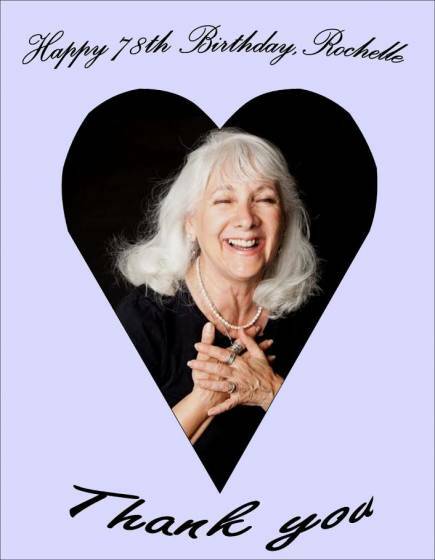 To help you think more deeply (and humorously) about it, please join us tomorrow morning (Sunday) at 8 AM (PT) as we celebrate Rochelle's birthday with you and discover all the hidden places "thank you's" have been hanging out waiting for your attention..
As usual our program includes humor, music, insights and surprises. So, if I may, I'd like to say, "thank you" in advance to you for choosing to be with us as we discover just how much there really is to be thankful for. And, of course, a big thank you the happy birthday wishes you're sending to Rochelle.